Owing to our expertise in this domain, we are engaged in providing top class Car Driving Simulator. Our workforce manufactured this driving simulator by making use of advance technology & finest material after following the industry standard. This driving simulator is in great demand in the market for its less maintenance. 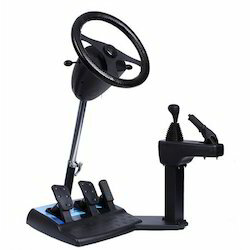 We are giving this driving simulator to our customers in a committed time frame at affordable rates. Patented homely driving Game Simulator is a useful machine for the driving learner to master the basic driving skills as soon as possible. Its hardware (steering wheel, throttle, clutch, brake and gear, are exactly the same as the real car, and instrumentation, methods of operation are basically the same with the real car. Its software highly realistic scenes was formed by computer in real time and the image of vehicles, pedestrians, roads, buildings, traffic signs may change with different training level. speech synthesis technology could simulate different sound such as mechanic sound, sound of horn and sound of wind, snow, and rain and various voice around the surroundings, which giving you a feeling as if you were driving the real car. It is the world's first product in the industry which has obtained national patent. We are specialized in offering the superior quality assortment of Portable Car Driving Simulator. These driving simulators are developed with topmost grade material and latest technology in conformity with the industry accepted standard. Our driving simulators are well tested on numerous parameters of quality before delivering to customers. Furthermore, offered driving simulators are available in numerous specifications according to the client's demand. High reputation with national patent and CE certificate. First manufacturer of Portable car driving simulator in the market. Easy to use, just need to connect to computer and install CD. Solve the problem of the driving learner's working busy, less time for training. Solve the problem of wasting time for booking and queuing. Solve the problem of when driving learner's get the driver's license but not drive often, and then decrease the driving skills. Standardization of teaching and provide different teaching for different ability driving learner. Enhance the efficiency of driving learner's learning. Reduce the labor length and intensity of the instructor. Enhance the efficiency of the instructor training. Improve the standardization of teaching. Reduce equipment repair costs, fuel consumption and the costs of driving agent's teaching. Increase the driving learners' test passes rates.